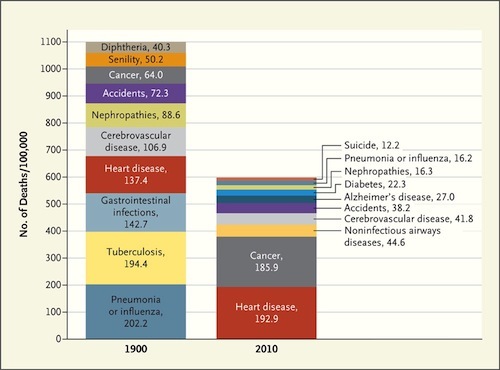 The chart above ranks the top ten causes of death in the years 1900 and 2010. Overall, the number of deaths per 100,000 people has decreased by almost half. However, two diseases have surged to become the top two causes of death in the United States: heart disease and cancer. Each disease also claims more lives today than they did in 1900. Heart disease increased from 137.4 to 192.9 people out of every 100,000; cancer increased from 64.0 to 185.9. While cancer and heart disease claim more lives today than they did in 1900, remember that they generally affect people late in life. As life expectancy has increased over the same period — from 49.2 in 1900 to 78.5 in 2009 [2-3] — the numbers reflect advances in medicine and improved healthcare in the country. Thanks to vaccines, antibiotics, and improvements in the standard of living, other ailments have disappeared completely from the list. The first successful diphtheria vaccine was developed in 1913, and tuberculosis later in 1921. Jones et al. The burden of disease and the changing task of medicine. N Engl J Med. 2012 Jun 21;366(25):2333-8. Life Expectancy in the United States. CRS Report for Congress. 2006 Aug 16. Life Expectancy. Centers for Disease Control and Prevention. Accessed 1012 Jul 8.